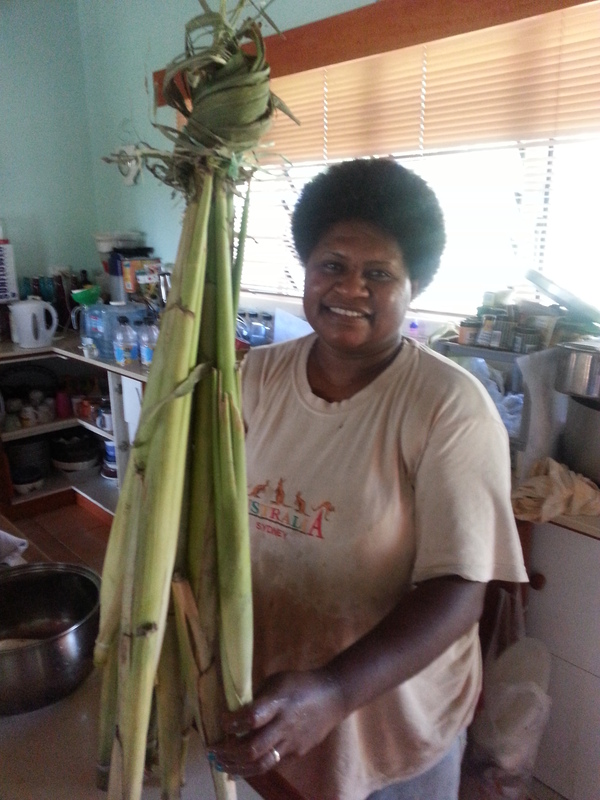 Fiji oh Fiji – Fiji Domestic Goddess Angela Ramacake Birch Delights Us With Her Home Cooked Tucker and A Night of Fijian Lovo Foods. 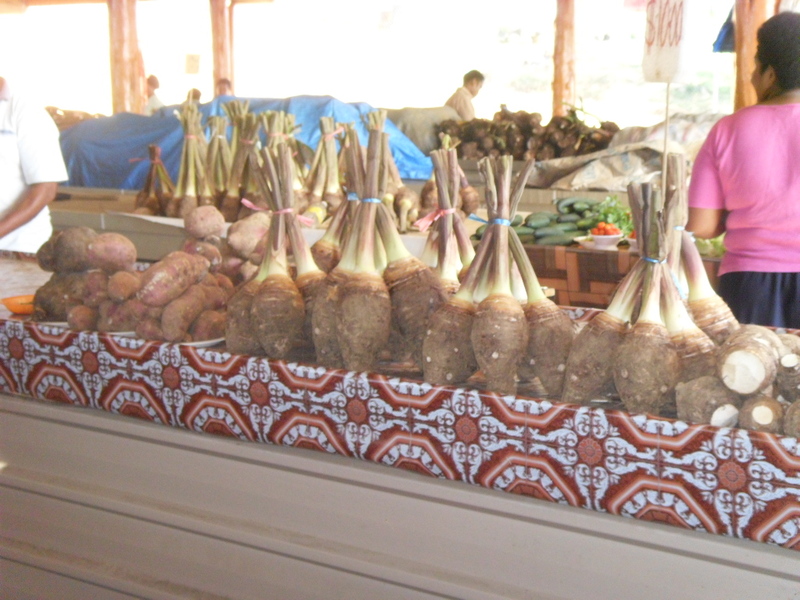 This time around, because I did not want to do anything but hang around Sandalwood Lodge and I had the opportunity to watch Angela cook, taste really good REAL Fijian food, I even did some cooking, I learnt how to prepare Duruka from Dole and most importantly I even got to do a class in Fiji. My first baking class in Fiji, I was so happy. 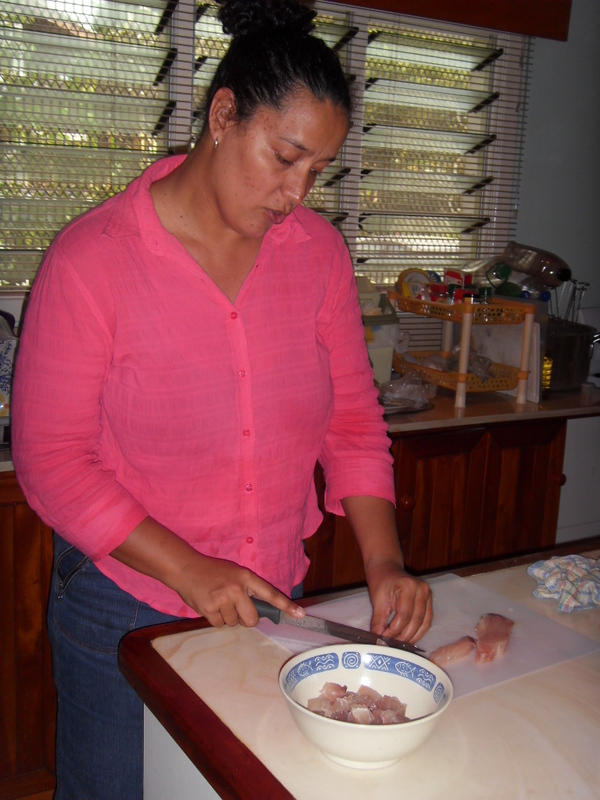 Now over the years, Angela has become quite the cook that I think the whole gang could not imagine. Well, to be frank Aunty Ana Birch (Angela’s mum) is an excellent cook, so it would only be a matter of time before Angela would follow suit and she really has. Angela has this knack of cooking and baking with the least amount of ingredients and the end results are just simply fabulous. 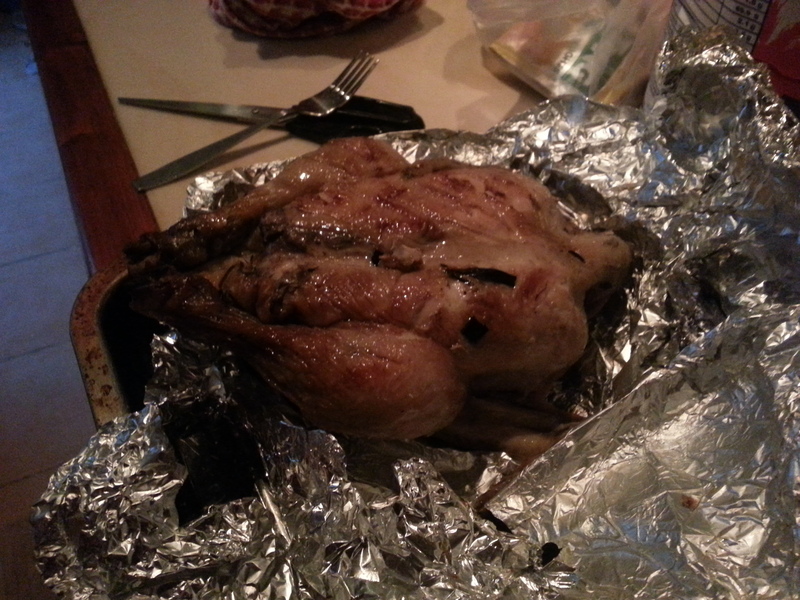 Her Roast Chicken is one of them, just salt and the chook is just wonderful and her beef bones was just out of this world, and I admit I did taste the meat while tasting the gravy and all it was beef and oyster sauce cooked till all the gravy was gone, and it was simply wonderful. 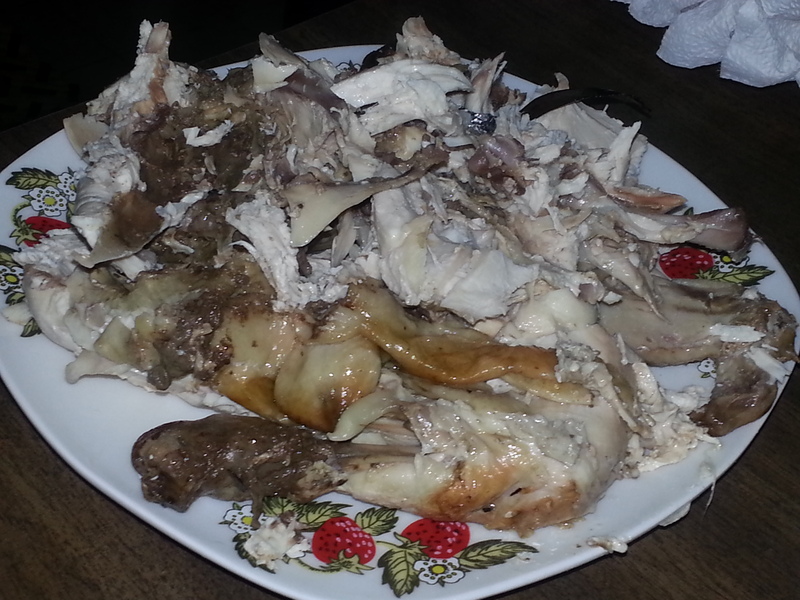 If I was eating meat, I would have devoured a good amount of it. Funnily enough as a cook, I would never have dared to serve a meat dish cooked with one ingredient, but Angela has changed that silly mindset of mine. 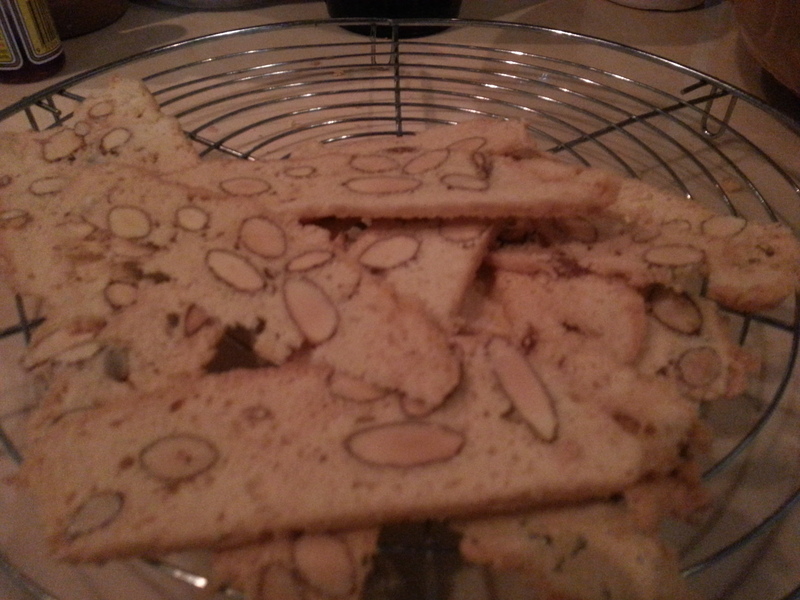 And I admit, I have never been able to do Biscotti. I have made it so many times and it has been a major failure after failure that I just don’t bother. And then Angela does one at nearly 11 pm at night and it turned out perfect. And the next morning I wake up to oh so perfectly sliced Biscotti right out of the oven. We didn’t even need a container to keep it because Meretalai, Dole and I ate everything even before Meretalai left for school. It was that good. Her roasted vegetable salad had all of salt and Balsamic vinegar and it was crying to be eaten. 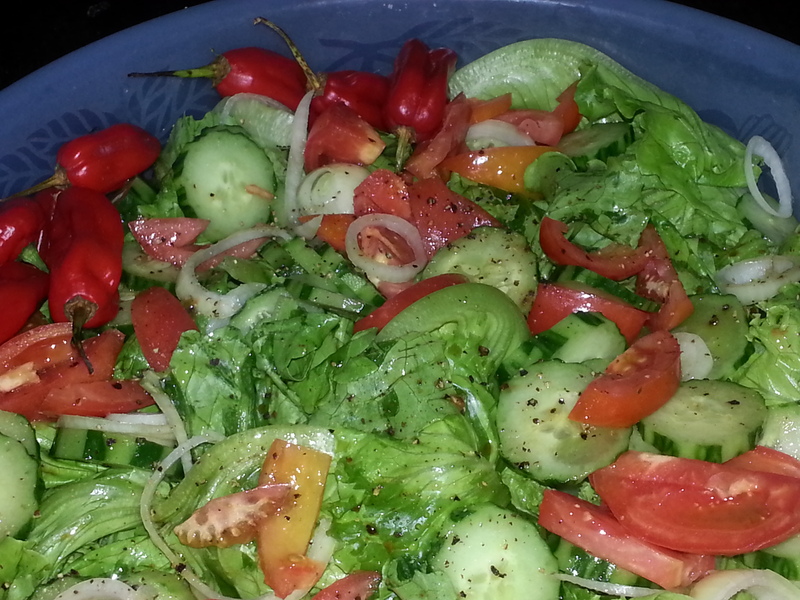 You could taste every single vegetable that was sautéed in olive oil and the dressing just acted as a complement. It was simple, fast and perfect. 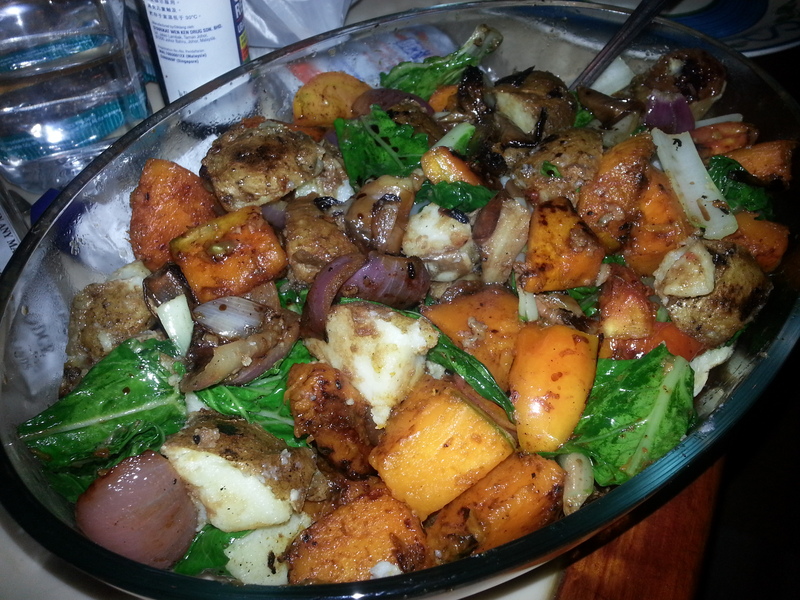 Each Vegetable was cooked in olive oil, then seasoned and roasted. To me it would have been perfect with any meat dish style. It would have been so perfect with her Beef Bones cooked with oyster sauce. Just perfect. On the third day I was there, the Fijian Golfing Ladies decided to have a party at the lodge. I really half didn’t want to go but in the end I was helping set up and so I just got roped in. Now I have not had good Fijian Food in a long time. I did have it in Bale’s but somehow a restaurant or store bought food can never be matched to home made food. So this time Aunty Sulu did all the cooking and I was told there would be some Lovo food. Lovo is underground cooking, something I have never been able to observe even from University days when the Fijians would cook a Lovo for International day because I would be busy preparing my Satay and all with the Singapore chicks, simply because back then none of the Malaysian students ever took part in anything. I still think it was sad. So now I was wondering how would someone do a Lovo for about 10 people. Isn’t that too much hassle? Amidst the music and the dancing thanks to Francis, a little Chinese man formerly from Singapore and now living in Fiji, we had such wonderful food. Now as everyone knows I don’t like fish that looks like the one in the photo. Before I could say no, it was plonked on my plate. 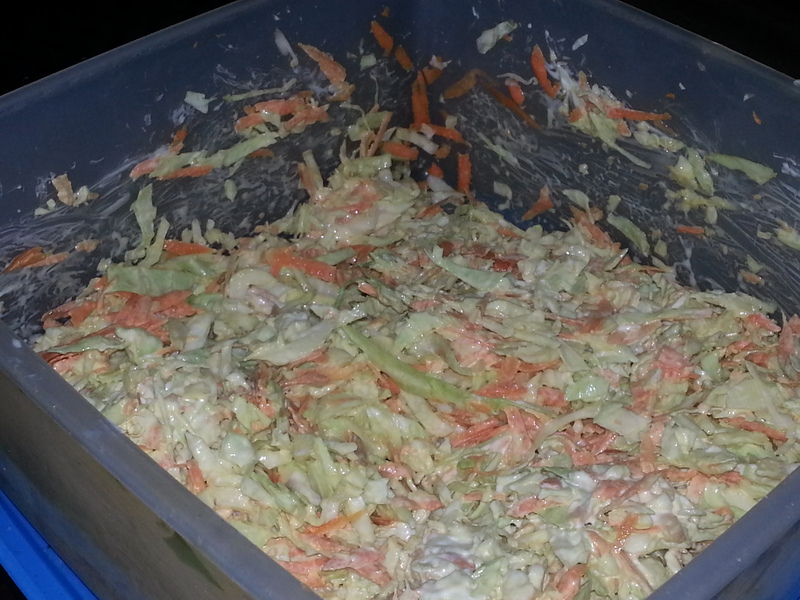 So I poured some coconut cream as instructed and took some palusami, taro and coleslaw. So much for not wanting to eat. First mouthful was orgasmic. The fish was so fresh, and its fishy flavor together with the coconut milk and wild ferns and a bit of palusami was to die for. It was a perfect combination of flavors. I was so worried I would get cold sweat eating the boiled fish, but I was so wrong when everything was mixed together, the plethora of flavors was something else. The smokiness of the taro was wonderful. I wish I had tried the chicken but I was still trying to be strong. The Palusami was nothing words could describe. 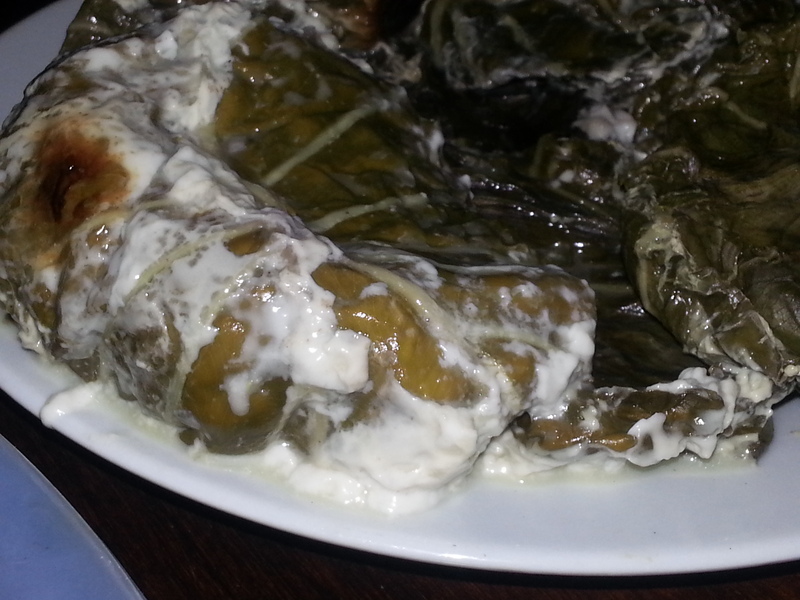 It was just the leaves, salt and coconut cream, three ingredients and the flavors were out of this world. How I wished they could tin palusami like that. I mean we have all these ingredients here in Malaysia, and I doubt we would have tried something like that simply because of the lack of flavors. My next feat. Make Palusami on a BBQ! 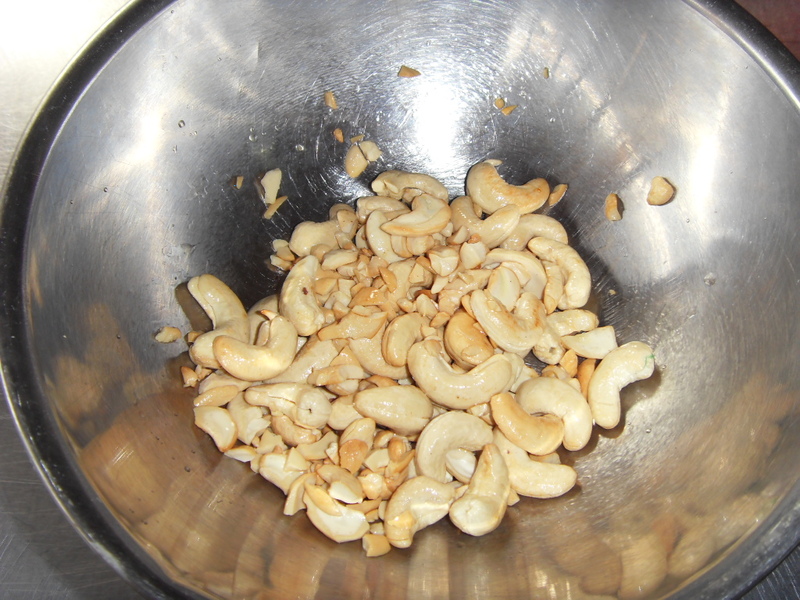 I also learn how to make Duruka. Now I do not know the name here in Malaysia, but I ate it once with Hafiq at a vegetarian restaurant and the waiter said it was part of the sugarcane which I found odd because when I cut open my young sugarcane and nearly got killed from mum for doing such stupid things, I never found that part of the sugarcane. 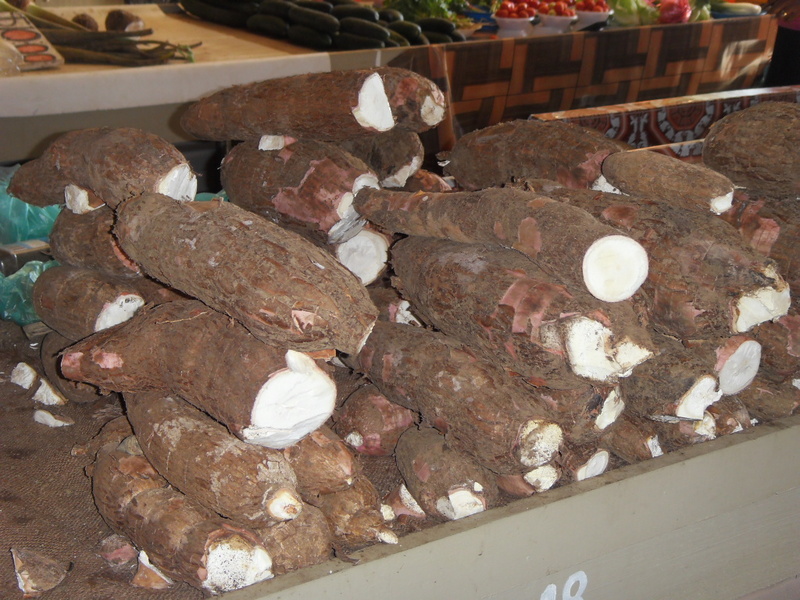 So there we were at the market and I asked Angela what it was and so she bought it for Dole to prepare. 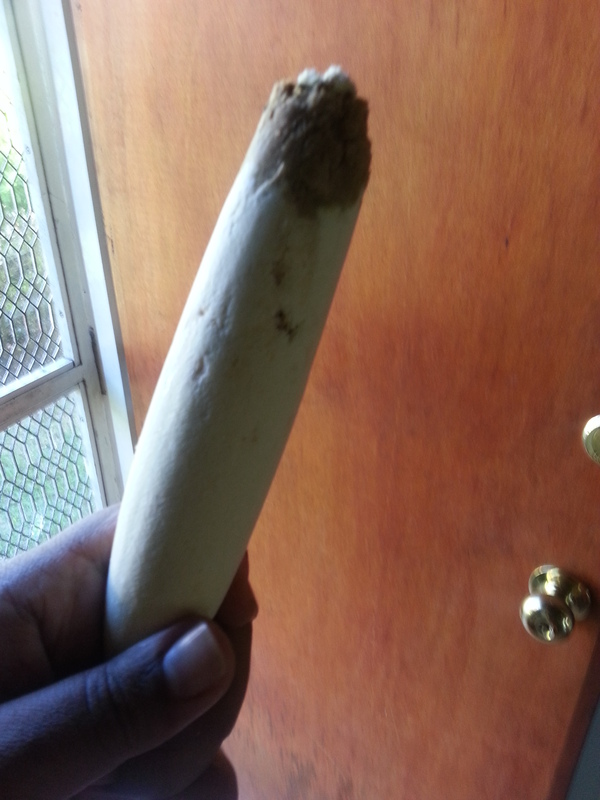 So there you have it, Duruka with coconut milk and salt. For me, I would have made it into a vegetarian curry, even a Duruka varuvel would have been good because I feel the marrow like texture of the Duruka would have absorbed all the flavors of the spices and ingredients and still maintained its shape and it would have tasted really good. I think Duruka would also be wonderful cooked nonya style again because of its ability to absorb flavors without falling apart. I must look for it here. Finally, I made Fried Noodles in Fiji for dinner one day. 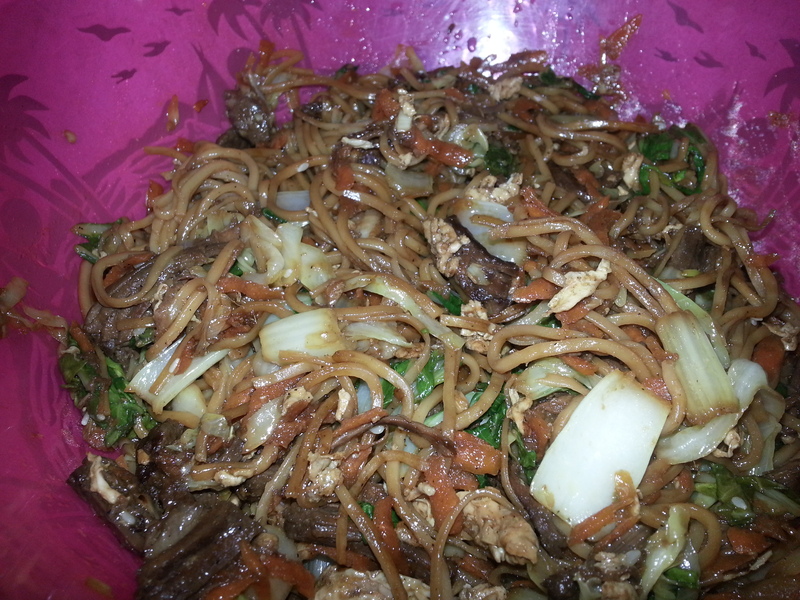 Bought Non Egg Noodles from RB Patel’s and cooked it with vegetables and remnants of Angela’s beef. We even cooked in a wok, something Angela has never done before in her life. We got a second hand seasoned wok from the flea market, from our favorite Japanese Restaurant owner Ohra. Ohra (if that is his name) has retired and he was selling his wares and so of course the Asian in me spotted its worth and made Angela buy it. 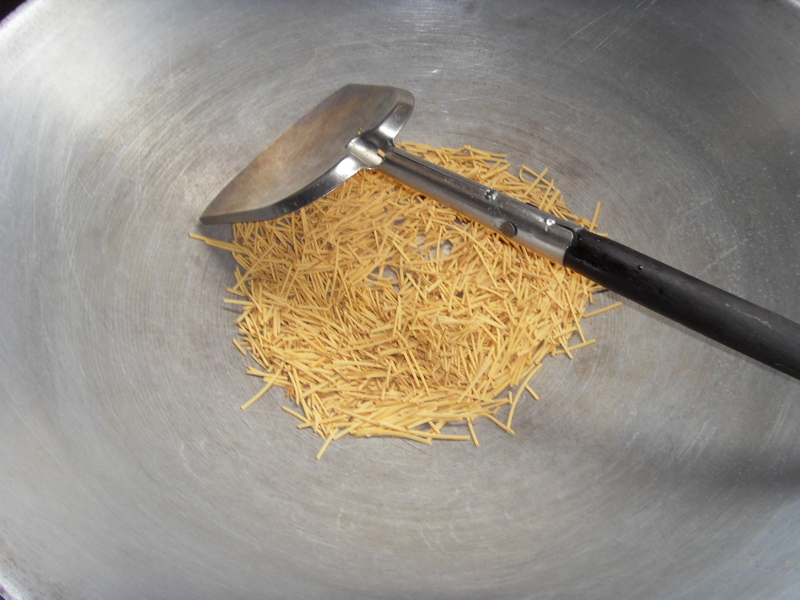 My Noodles with too many ingredients. Now people often ask me why I never take scenic photos when I travel. This is the reason. Because to me to be able to learn from people is much more valuable and priceless. Thank you Angela Birch and Dole, and also Aunty Sulu for the wonderful wonderful food. 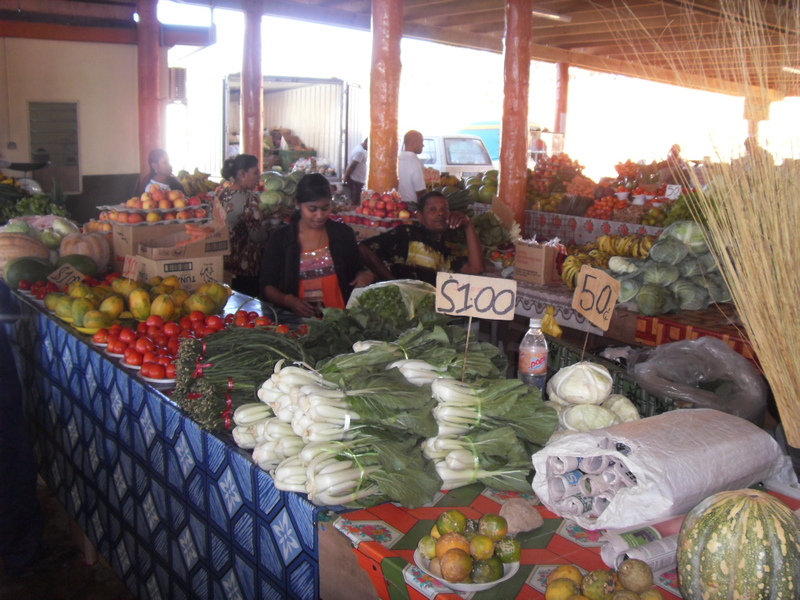 Fiji oh Fiji – A Foodie and a Friend take time off. I had eight days of bliss in Fiji with Angela Birch and Meretalai… It was just totally awesome to be able to spend eight solid days there doing absolutely no sightseeing and just behaving like I was Fijian. I believe those are the real holidays when you feel self actualized in a country that is like a home away from home…or otherwise, Angela Birch knew how to treat me well. For the life of me, I cannot seem to remember what I did the first day, I mean I had a whole day starting at 5.30 am when I landed and for some odd reason I do not have anything documented or photos, and that is a very strange thing for me. I wonder what I ate that day, because I know for a fact I did. Oh I remember, I brought along a packet of Baba’s Uppuma mix and made it with Mashed taro leaves and carrots, and somehow the greenness of it was not too photogenic. Healthy though, but not too photogenic. Meretalai was a little queasy eating such green stuff but she managed to eat a bowl full after getting evil stares. And the next morning for breakfast Dole made Uppuma patties which was rather nice I should say. Just the right crisp on the outside and soft on the inside. So now the food travel begins. At 11 am I was sitting in Taste Fiji with Angela and two other hotel guests. Now if you have noticed, Taste Fiji is on my Facebook and I have liked it from the day they came on by just looking at the foods and desserts they produced. Seems like in that short time Taste Fiji has a good number of regulars because I went there almost every other day and the same people were around at different times of the day. So if you’re in Fiji, try it out. 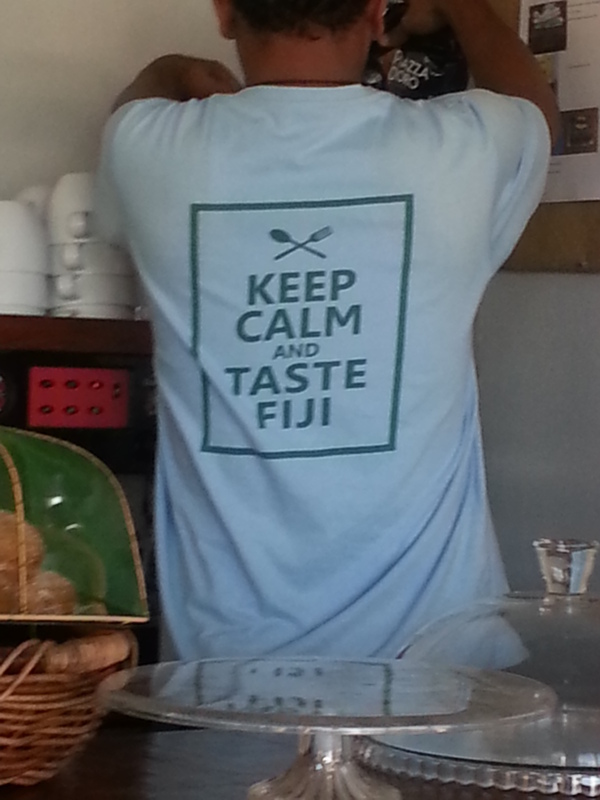 They serve all things produced in Fiji, and I think this is an absolutely good thing to do. It’s like the modernity in the foods with an old charm tilt to it, here and there. 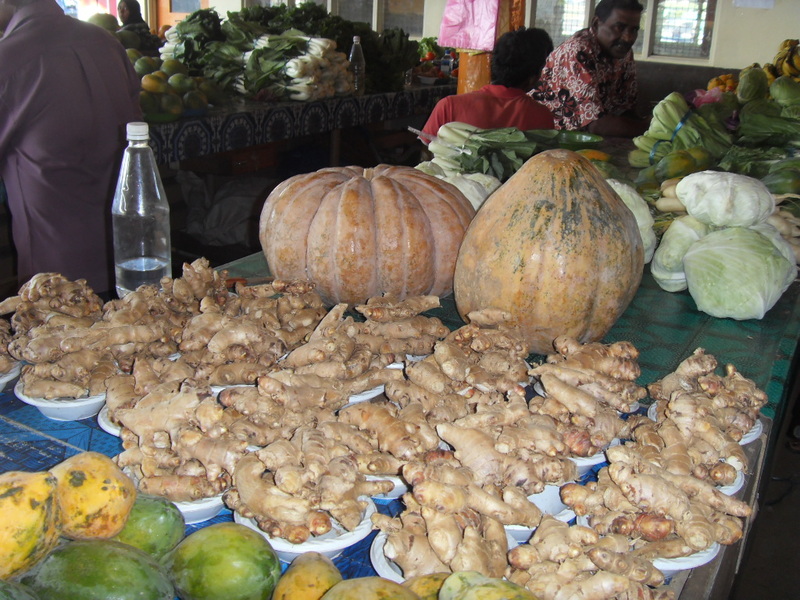 Other then that they serve wonderful café delights all concocted by using Fiji made and grown produce. 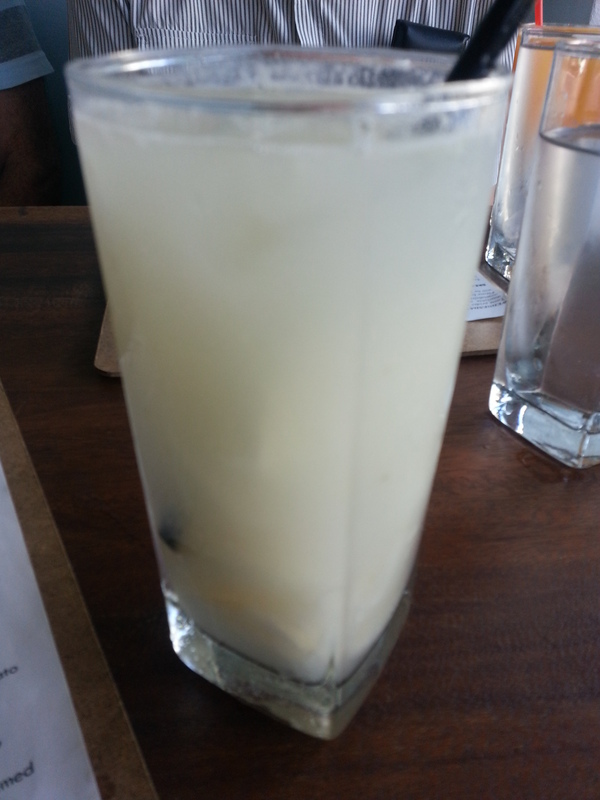 On that day, we had a late brunch lunch thing, so I started off with Sour Sop Juice. Now I have had Sour Sop juice in KL and it was absolutely horrid almost every time because it tasted like cordial, so I took a chance only because Angela was having one, so I could actually say something about it in a “whatever fashion” for her to roll her eyes and swear at me in Fijian in front of her hotel guests who would have thought she was calling me “sweet darling from a land far far away”…..but low and behold… it was like eating the sour sop fruit that was scooped out from the fruit straight into the glass. 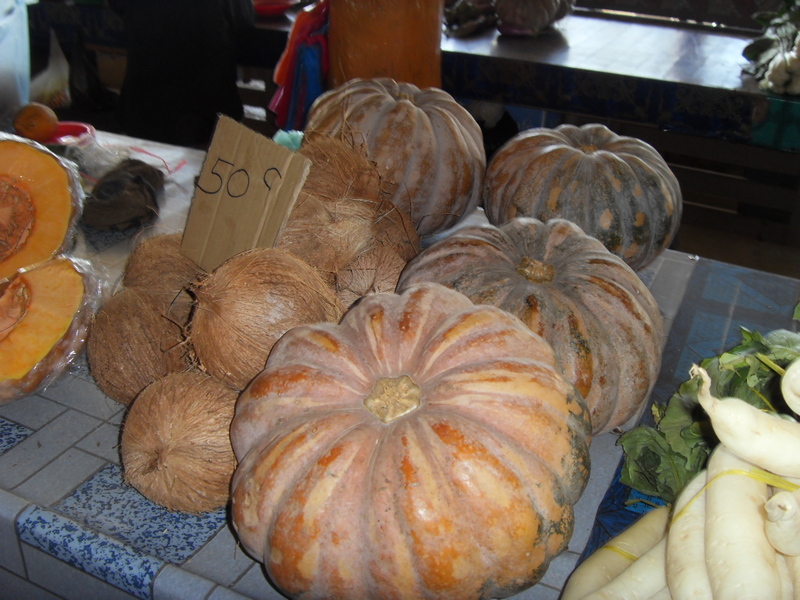 It was so full of luscious sour sop flesh, I could not believe it. I ate my drink with a spoon. It was not thick but rich much like a melted sorbet, vanilla ice cream only sweet and sour and absolutely perfect to shock the palate after the last few days of eating in Australia. 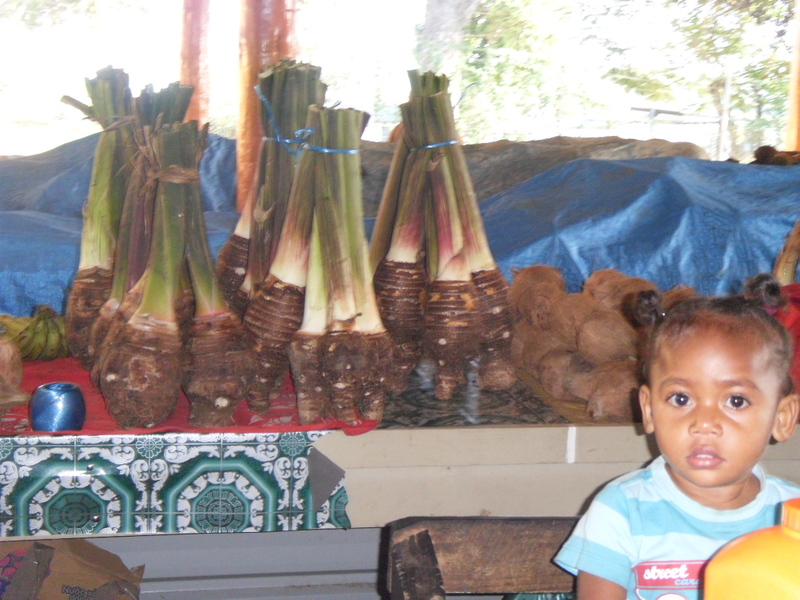 You know I never even knew Sour Sop existed in Fiji till this day. And this was by far the best I’ve ever had. I keep wondering why is it, in Malaysia, we do not get concoctions like this when we supposedly have quite a lot more of this fruit around? It is shameful to taste our sour sop beverages. So now we order our food, and I decided to have something from the grazing platter, as you know how I like to pick my food. 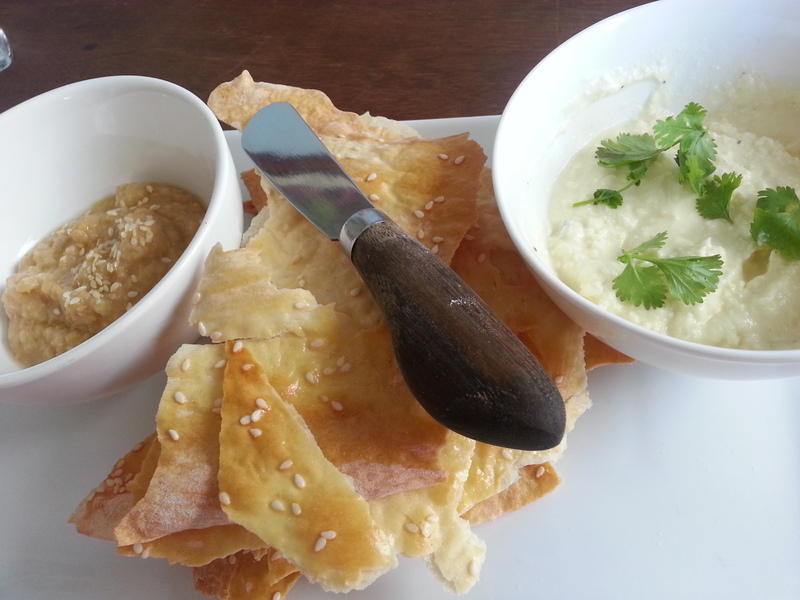 So I chose the Chick Pea hummus and local Whipped Ricotta and Baba Ghanoush served with sesame lavosh. 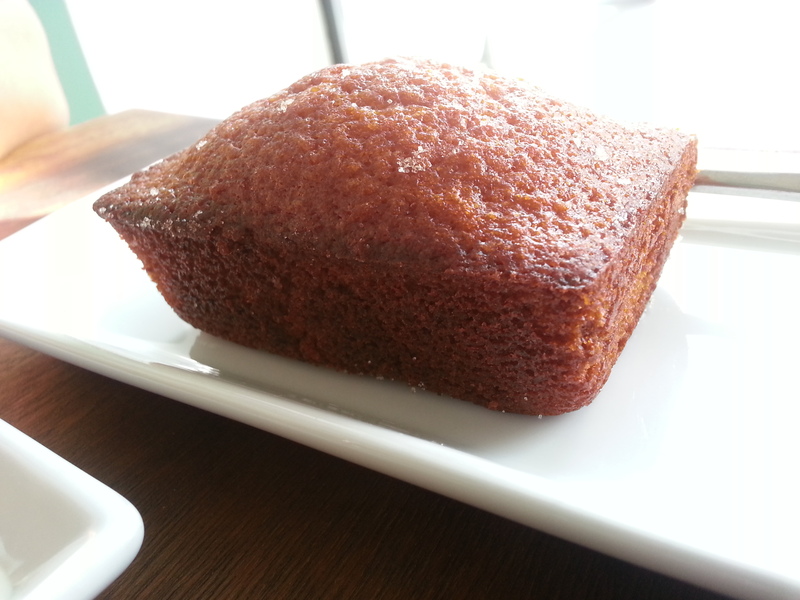 I expected something staid and standard, and when it was served, it was something else. For one I had no idea what local whipped ricotta would taste like. 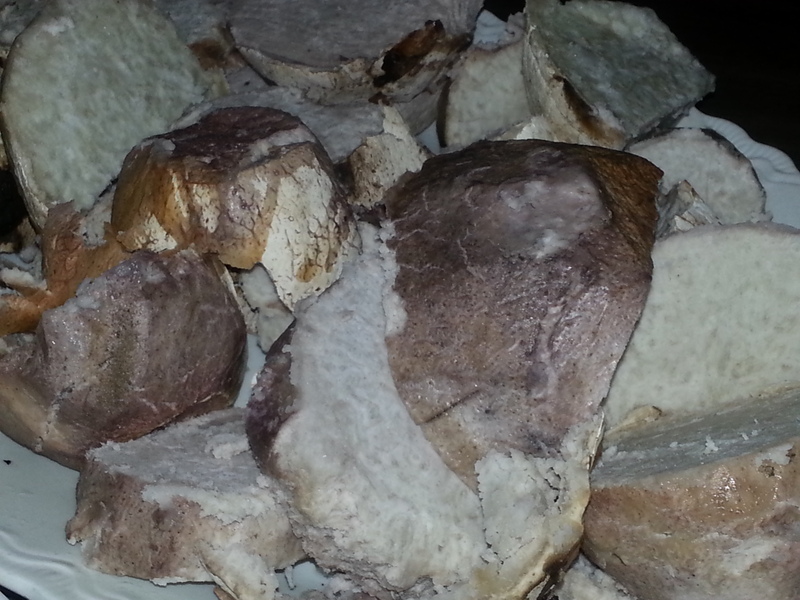 Other then ricotta from Australia, the US or Italy, I could not even imagine what Fijian ricotta might taste like. Frankly I have never seen a single cow in Fiji, so I still wondered. By the way they ran out of hummus… now this created a big void all through my holiday because everywhere I wanted to go after that I wanted something with chick peas. So I tasted the Ricotta. Now take it from me, this is not low fat ricotta because you tasted the milk, the creaminess and freshness of homemade ricotta. Frankly I had never tasted it like this before. The texture was not crumbly but easily spooned. It was like chewing on full cream milk bits. To me , all Taste Fiji had to do was throw in some berries and Fijian honey and they could come up with a new breakfast meal. I just loved it. The baba ghanoush was chewable and not pate like. It was something you could eat with a fork. The simplicity of it was what made it most endearing. If I had to make a dish with this baba ghanoush, I would add in mashed roasted red capsicum and roasted garlic, all roughly mashed and it could be a meal on its own. I did not have enough lavosh though. And I was too polite to ask since we had guest and I had to be on my best behavior. 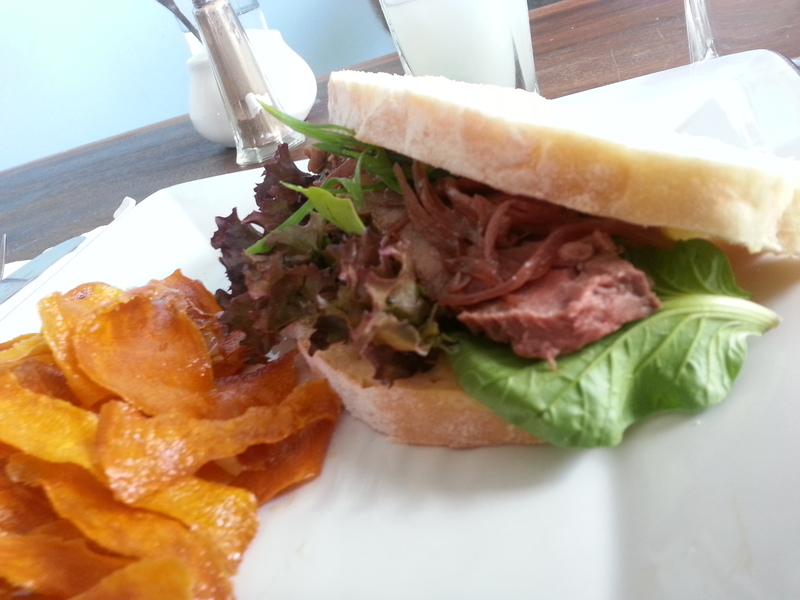 The next was the roast beef sandwich. I did not have an idea how it would be served, and from all my other visits, Fijian food is simple and no fuss so I half expected it to be in between two sliced of white bread which would most certainly upset me if I was somewhere else, but it was Fiji, so I would have just kept quiet. But No! it was served in between two slices of home made Foccacia bread, with lolorossa, and rocket salad and a pickled onions I believe. 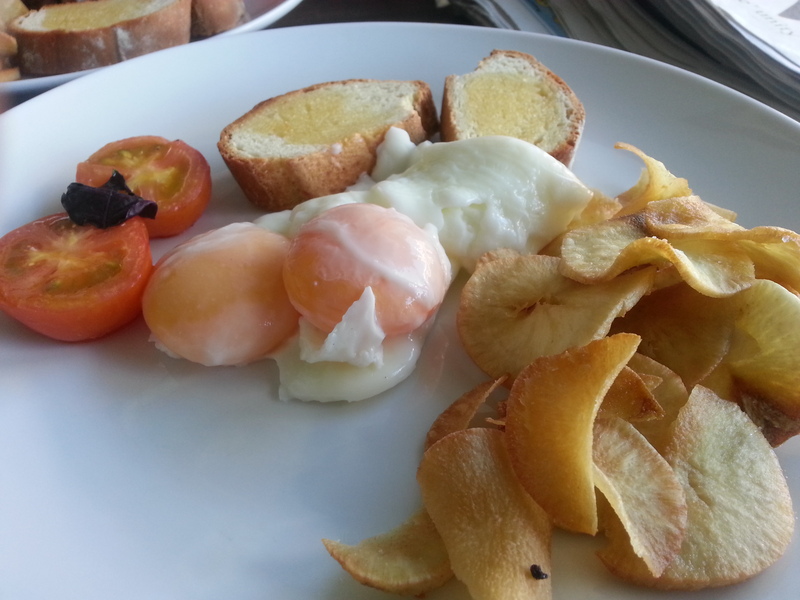 And served with freshly fried Kumara Chips. It was at this instance that I wish I didn’t stop eating meat because the succulence of the meat, the redness, the layering of it in between the bread, made it so sinful. 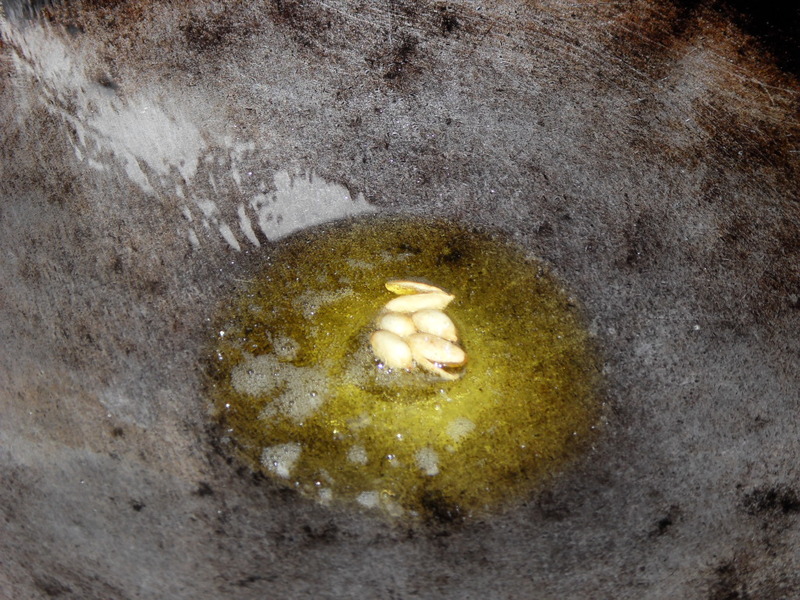 It was like virtually devouring it with my eyes. You know the saying,” he raped me with his eyes”. I had that moment watching them eat it. 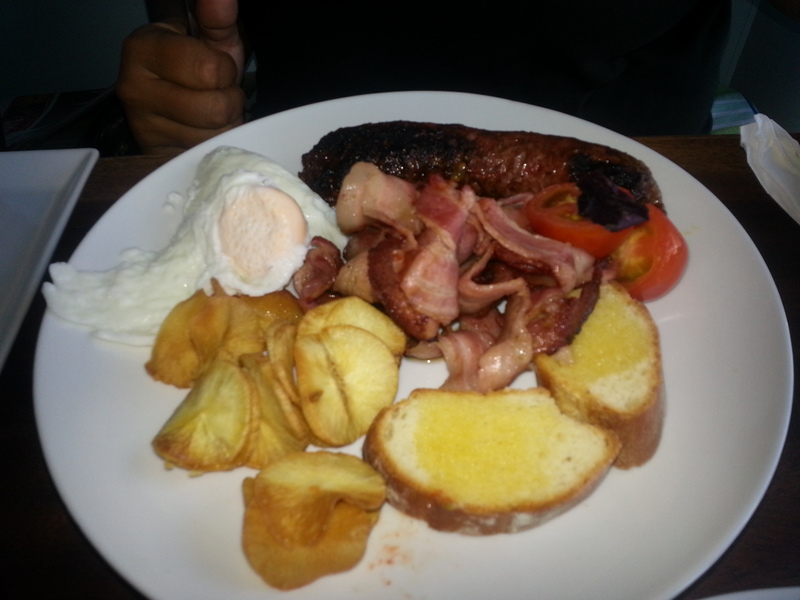 The next trip we were there, it was for breakfast, and I declared I wanted poached eggs and Angela ordered a breakfast plate with Vuda Bacon, pork sausage, cherry tomatoes and well you can look for yourself on the plate. 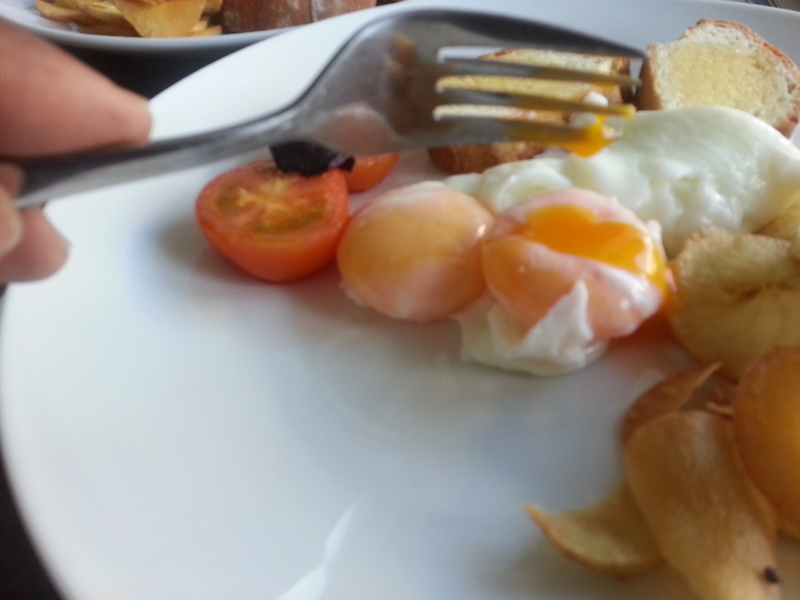 Now again all sinister like I wanted to see how my poached eggs would turn out since they were full house and we got the last table. So there you go, it was once again perfect. My only gripe. The bread was too small, and too crunchy, this is me, I like my toast to be bready and not too crunchy, so I had to ask for more bread. Other than that, breakfast was perfect. This was when I seriously wished I had something like this where I live. No pretense, no fanciness just good breakfast and everyone regardless of race and religion sitting there and eating without any thought. I seriously wish for that. One may mock at the prices and say it is too high, but I have eaten utter rubbish in some Restaurants in KL serving pretentious breakfasts. And it was almost triple the price with absolutely no volume. 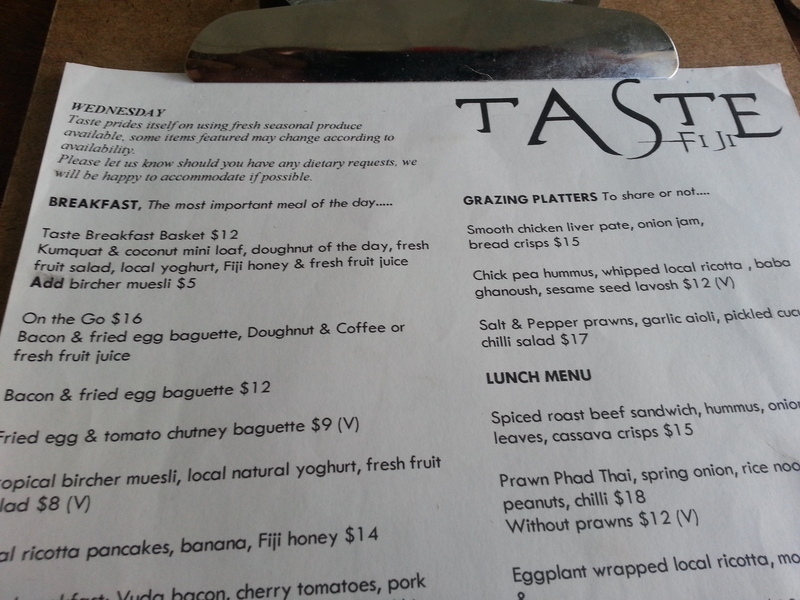 My third visit to Taste Fiji, I was left there alone half way. Angela and I went for afternoon tea. 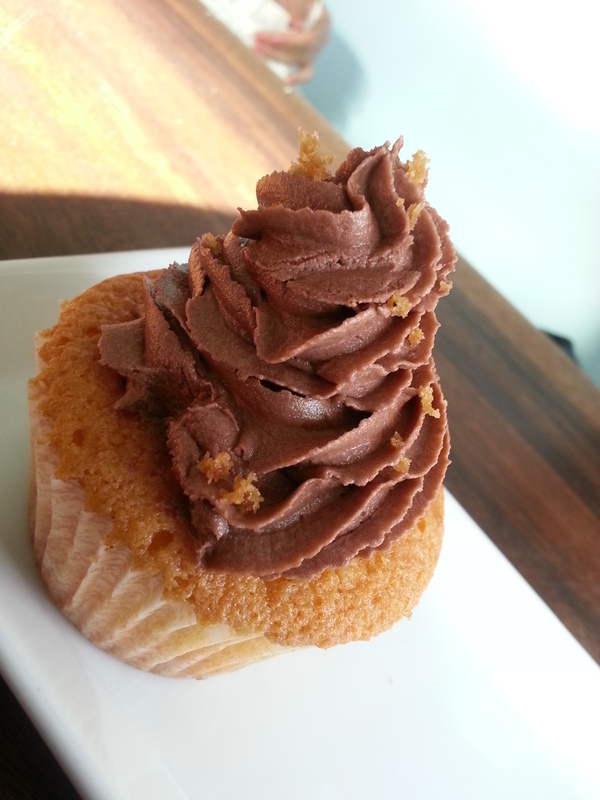 So we had a cupcake, a coconut cake which I thought was an Almond Friand and the last egg tart was on the house. The cakes were very homely, the chocolate butter icing was one you would surely finish even if you are not allowed sugar and coconut cake was just what the doctor ordered. It was the right denseness, and enough flavor and I think it would have been nicer with a blob of cream. Now the Egg Tart is unlike the Chinese Egg tart we get here in Malaysia. 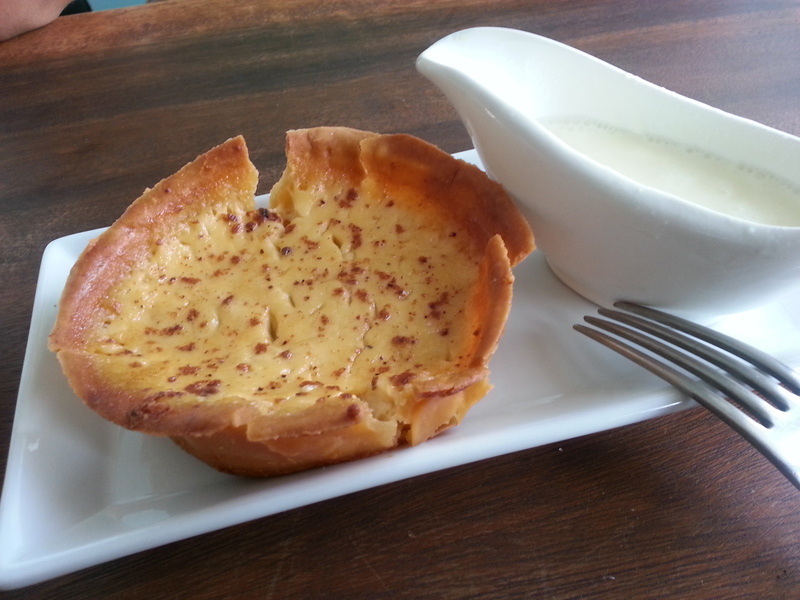 In fact I have never seen this kind of egg tart here. The pastry was so thin that it was brittle and the eggs were milky much like an extremely light crème brulee with that right amount of nutmeg powder. I think though, presentation wise, this would not look nice simply because the pastry was too brittle, but taste wise, for heaven’s sakes it was an Egg tart, not a pastry tart, so that’s what you got. I could have had another. Then I was left alone and was mingling with one or two people whom I had seen several times, and then I spotted chick peas on the menu. It was a salad, I really needed a salad at this stage. I have not had a salad for days. So here I had a very colorful salad. 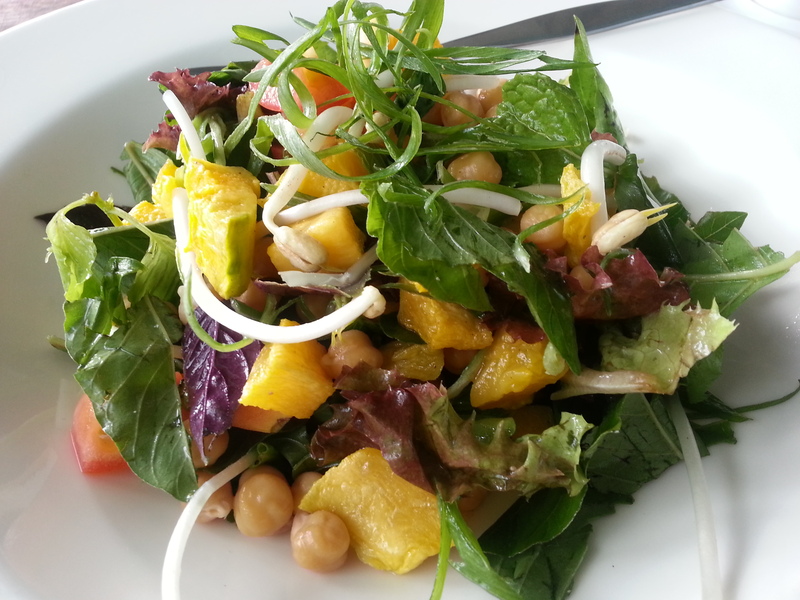 It had everything I liked, bits of slightly undercooked pumpkin, CHICK PEAS, all the greens, and even bean sprouts. 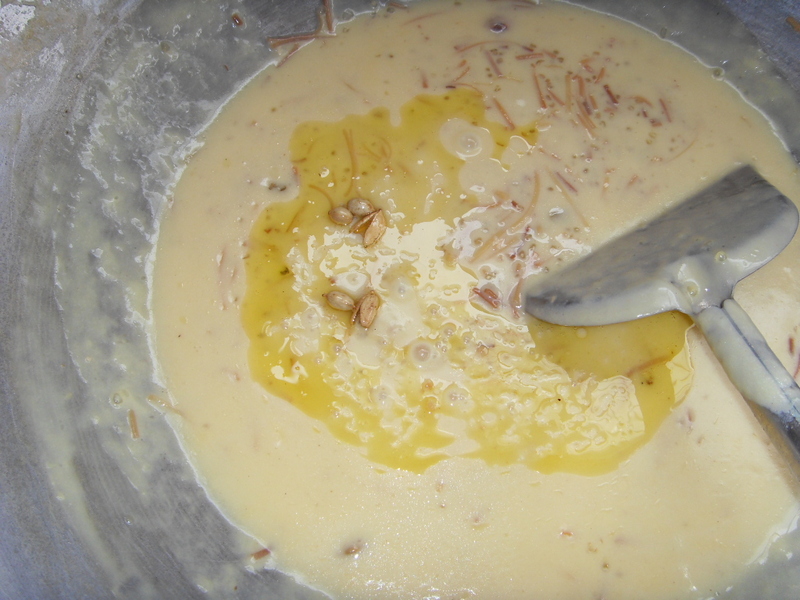 The piquant sweetness of the dressing was light as satin. 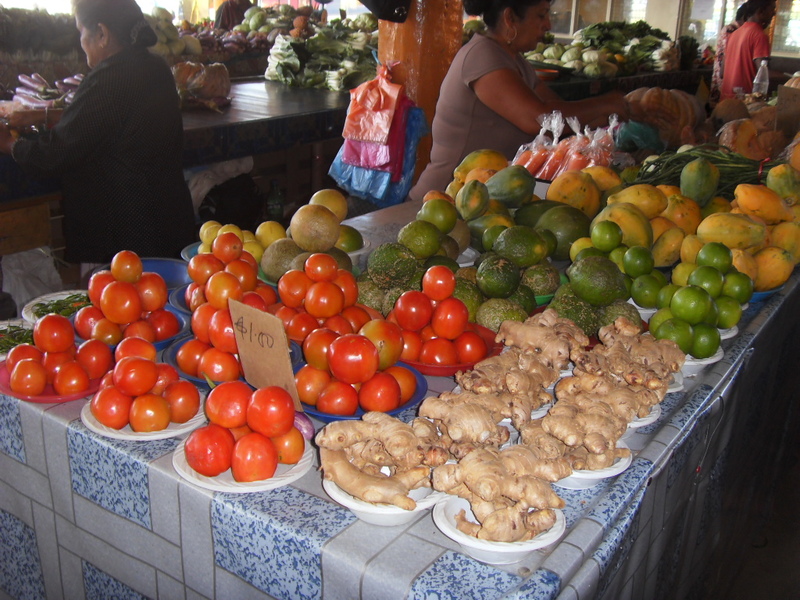 It complemented the vegetables so that you could taste each and every vegetable morsel that entered your mouth. I would rate this a perfect five star. No changes no additions, absolutely perfect. I still look at the photo and salivate. 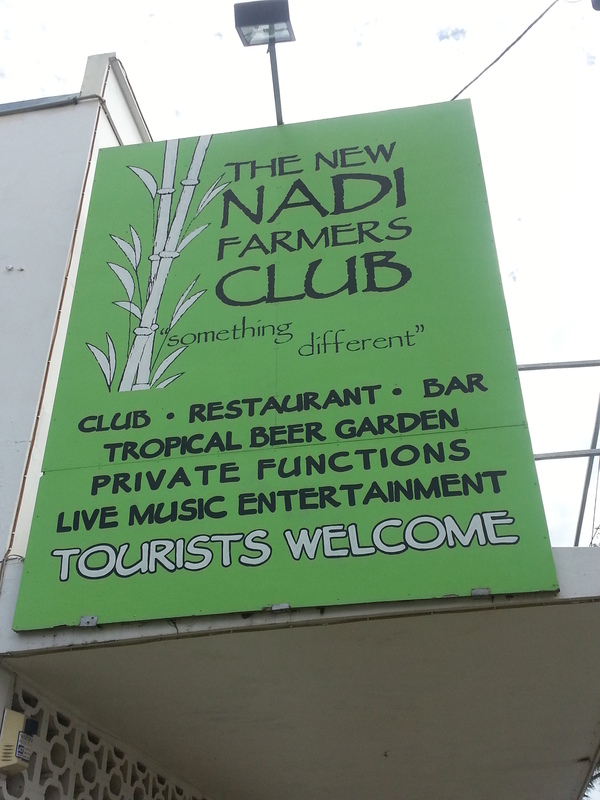 Another place we frequented more than once was the New Nadi Farmers Club. With it’s very 70s retro look left unchanged. All it needed was a giant disco ball and it would have been like a 70s flashback. So we sat in the back, casual dining, on a bench much like old school tuck shop. It was hot, a little cool, complete with the occasional fly checking us out but it was casual and again no pretense. One the first visit, I felt like chips and so we ordered a seafood platter. I guess I cannot complain about the seafood platter, after all it does not take a maestro in the kitchen to produce something like this. 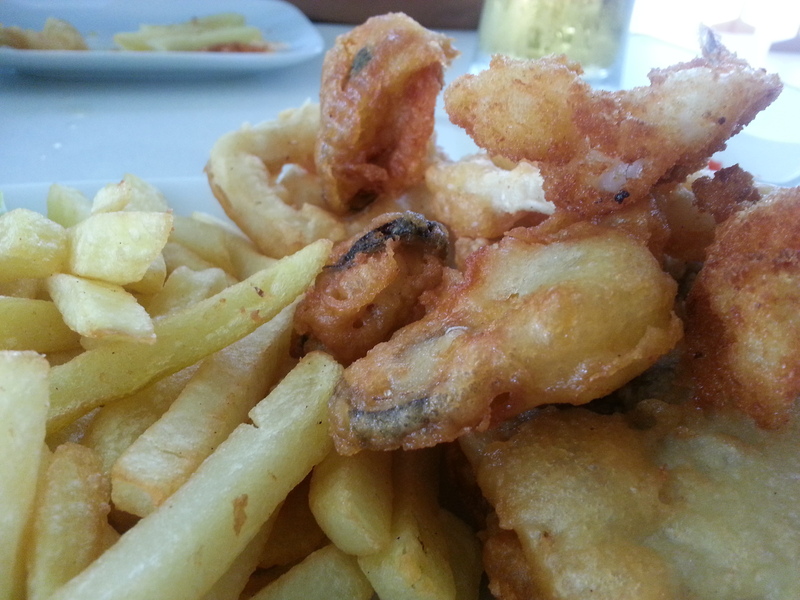 It was nice, something picky picky, it has fried mussels, fish, prawns and the like, and I did feel like it was a little pricy for my liking. I would not say it was bad but let’s just say we will not order it again only because, the second visit was something else. 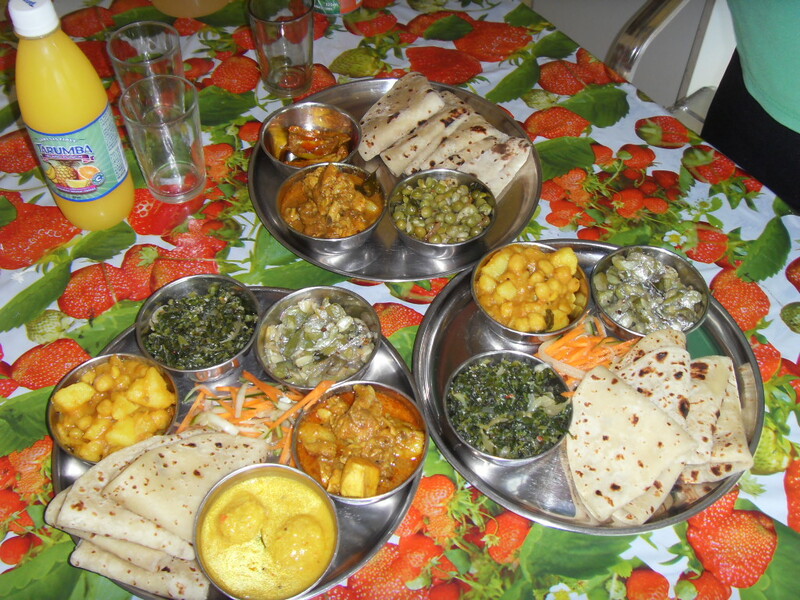 Now Fiji is famous for its Roti, which is much like a chappati but not prepared the same way. It is moist and fluffy, and I make better Fijian Roti than Chappati any day. 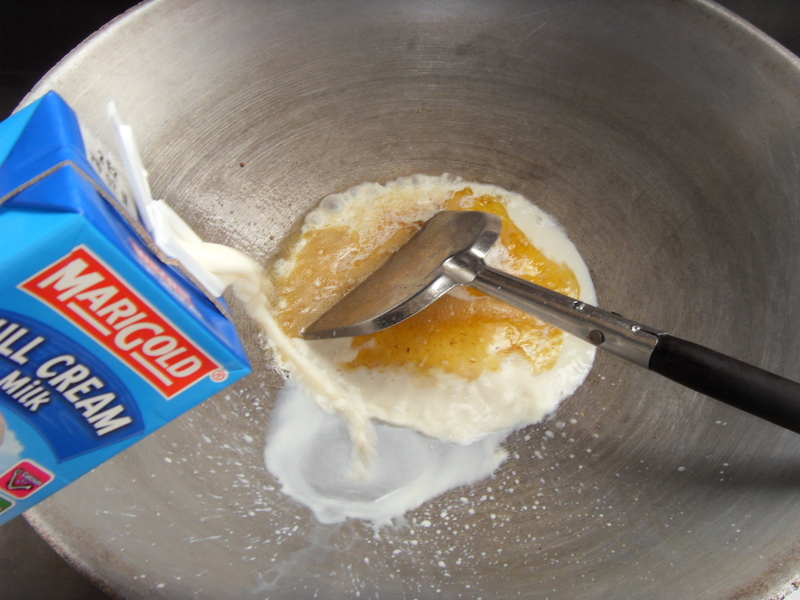 It is a very easy recipe that Dole taught me a few years ago. Now I have always liked the Roti and curry at Dr Rams, but unfortunately Dr Ram does not operate his restaurant anymore so here we were the day before I left at Nadi Farmers Club. We ordered Roti and Curry. Now unlike here in KL or Malaysia for that matter, if you order a Chappati, you get one and you get to choose a few free for flow curries and but the rest. 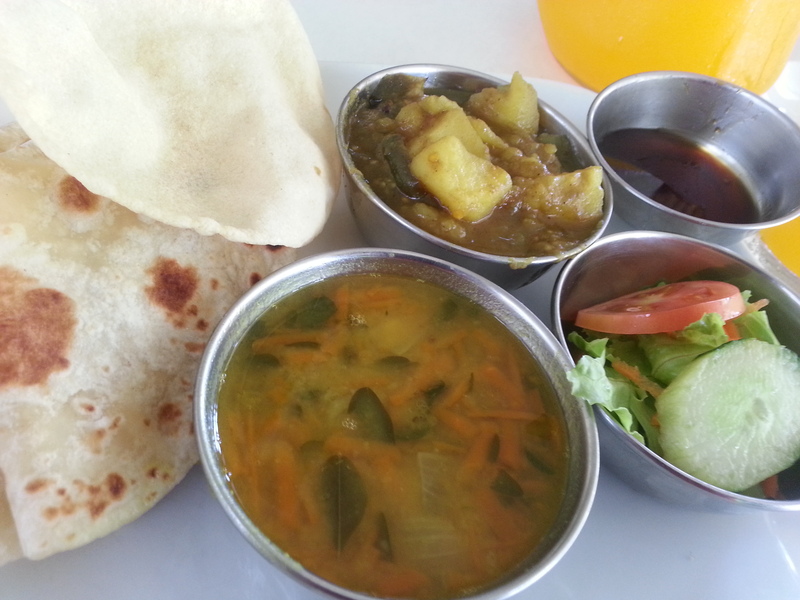 In Fiji, when you order Roti, you get three or four rotis straight away with a few curries. I guess it is because Fijians are big eaters and would scoff at the idea of buying one roti at a time, so it has something to do with culture. Food culture that is. Everything was just nice I should say but somehow after the whole meal, Angela and I were still peckish so I picked the Fish Chaser on the menu. Now both of us had no idea what it was, except that it was fish and possibly fried. 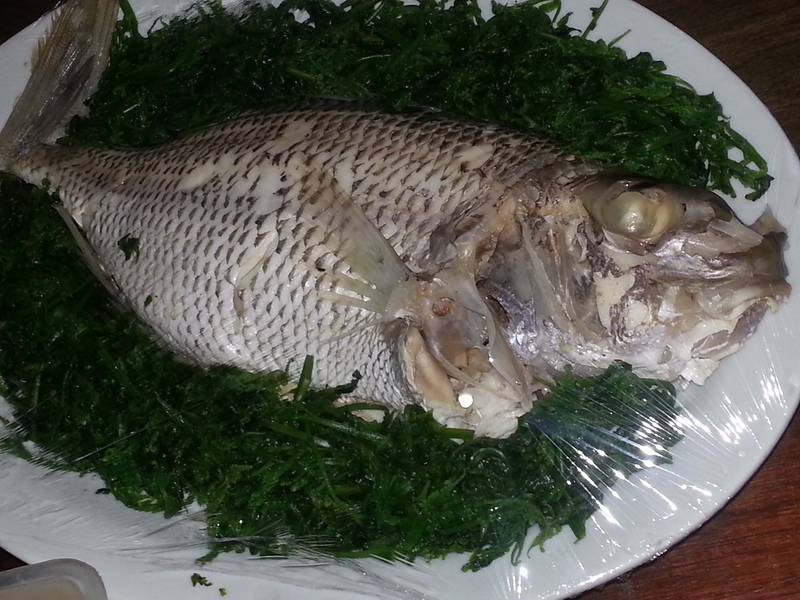 I half regretted at first thinking it would be like the fish on the fish platter the previous day. So we both waited in anticipation. Ohhh what sheer delight. 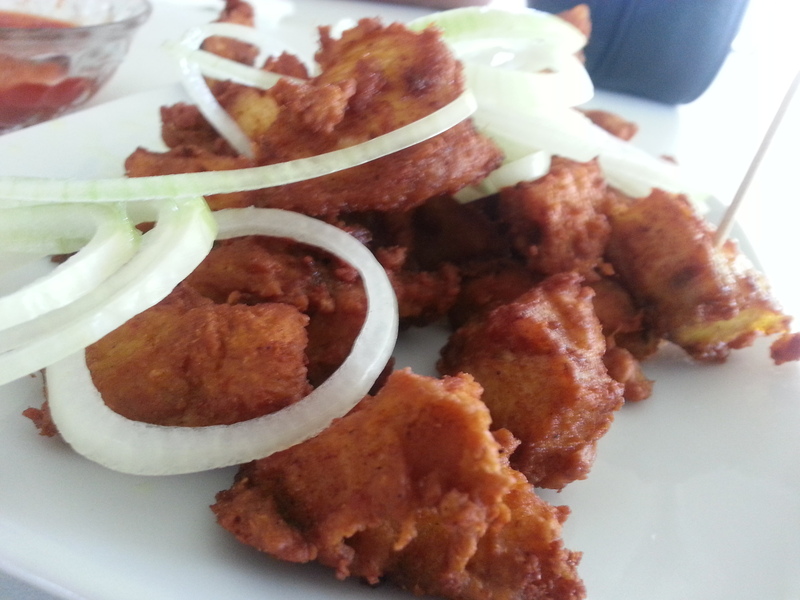 It was morsel sized fish fillets, fried in just the right blend of spices, not too spicy but just right. It was pieces of mackerel, it was perfect. So simple and so what we both wanted to eat. It was so good we ordered another plate. I even wrapped it in my Roti like a tortilla. It was what the doctor ordered. I do not think I ever want to emulate this dish, but I will surely have it again when I go there next year. Funnily I did not take photos of the fried bananas with ice cream and I am sure in the two days we were there Angela would have devoured four plates….ok ok so I shared! 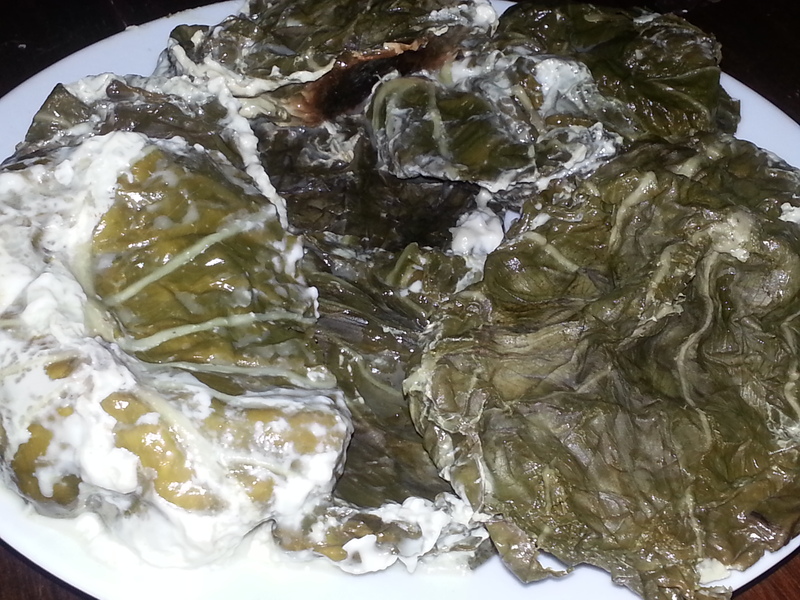 Kokonda is a Fijian staple that I have always loved. The fact that most of you know I do not like anything fishy, would make you wonder why Kokonda. Well it’s like a salad of sorts. 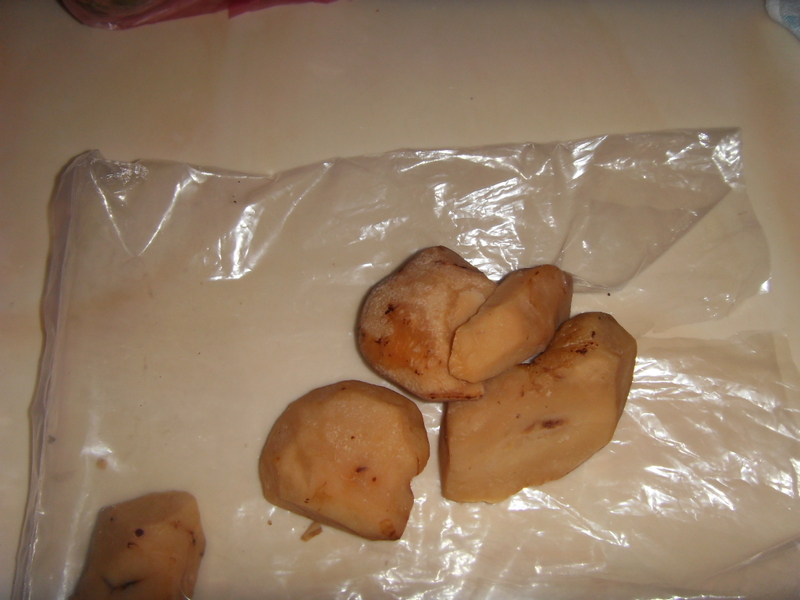 Funnily long time ago I attempted to make Kokonda. I found the recipe in an Australia Womens Weekly and to think they copied the recipe from the Fijians renamed it and Australiafied a few ingredients and called it their own. I used to eat Kokonda quite a bit when I was at University when I had quite a few friends who used to make it, unfortunately Angela was not quite the Domestic Goddess back then as she is now. In fact I also have a Kokonda recipe in my Recipe book, Healthy Eating Recipes for the Asian Palate. 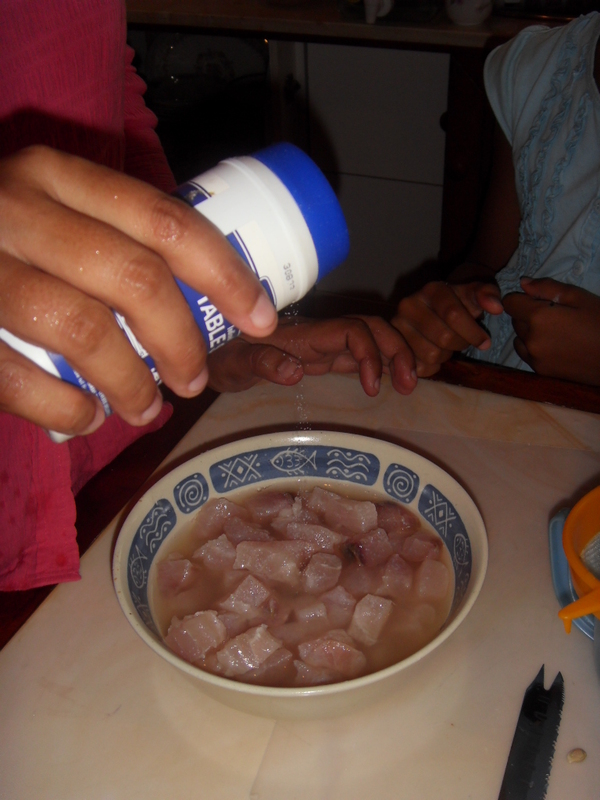 Now I was in Fiji in April and I really did not want to eat anything heavy that night so Angela decided to make Kokonda. 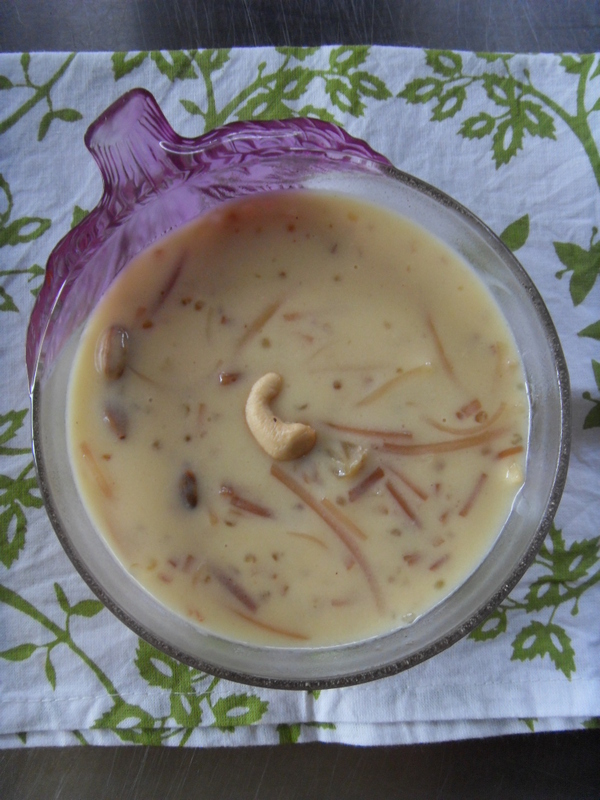 Originally Kokonda has coconut cream in it but you can opt from using coconut. Alternatively I am sure you can throw in salad vegetables like tomatoes and capsicums cut in to small pieces or diced just before serving or in Angela’s case, she uses coconut water. Alternatively you can do what Angela does, she adds in fresh coconut water into it. Lovingly Cut the fish into little bite size cubes. 2. 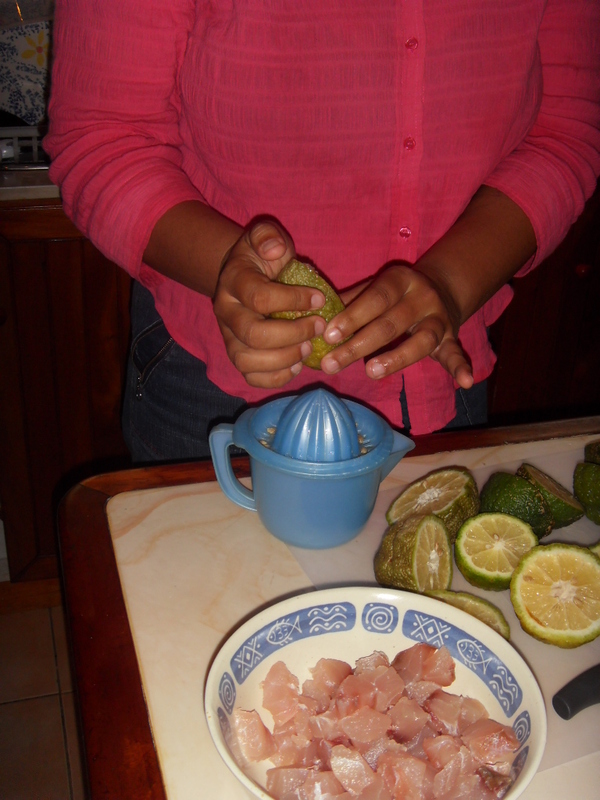 Squeeze luscious bush lemons and make sure seeds are removed. You can use as many as you like, its up to your own taste. You also add in the coconut water at this stage, about a cup or so. 3. 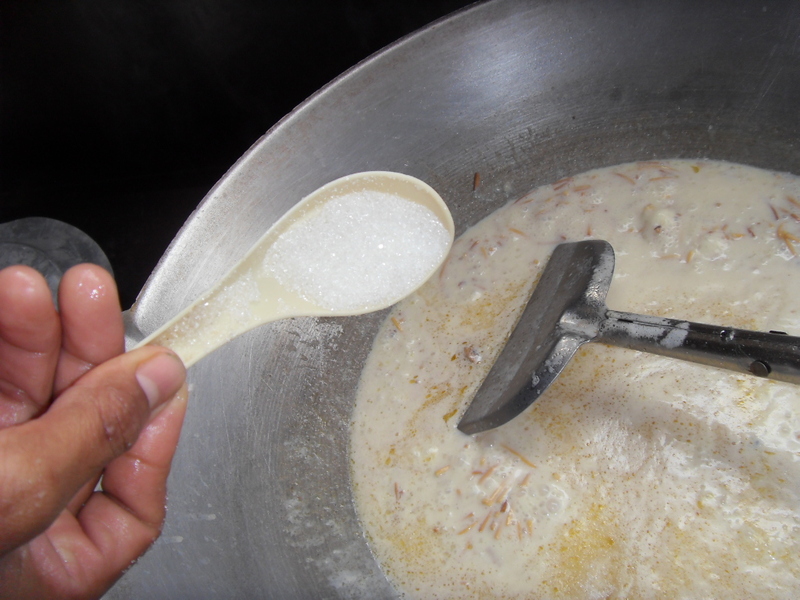 Add a little salt and stir through. Leave aside for about 30 minutes or so. You may fridge it for a few hours. 4. 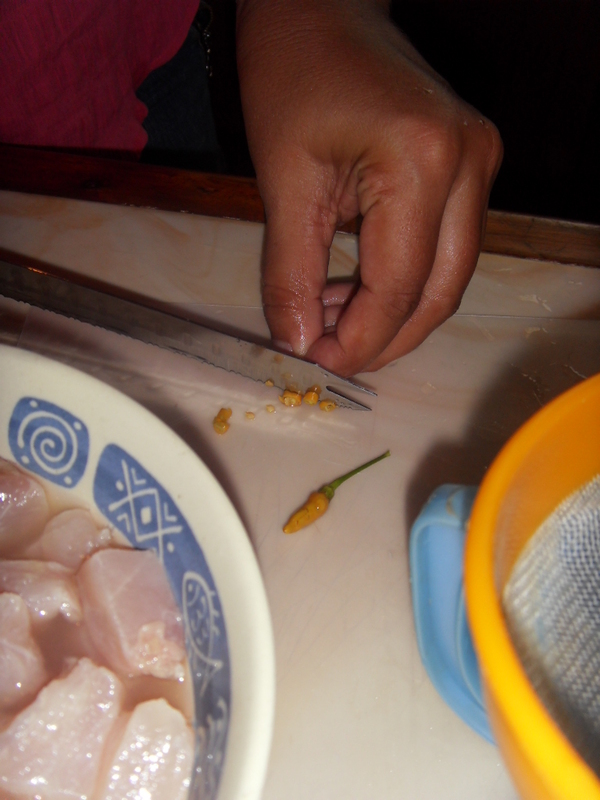 Slice some birdseye chillies, now I really do not know where this chillie habit came from because as far back as I’ve known Angela, she could never eat anything spicy… nowwwww… she eats spicier stuff then me. 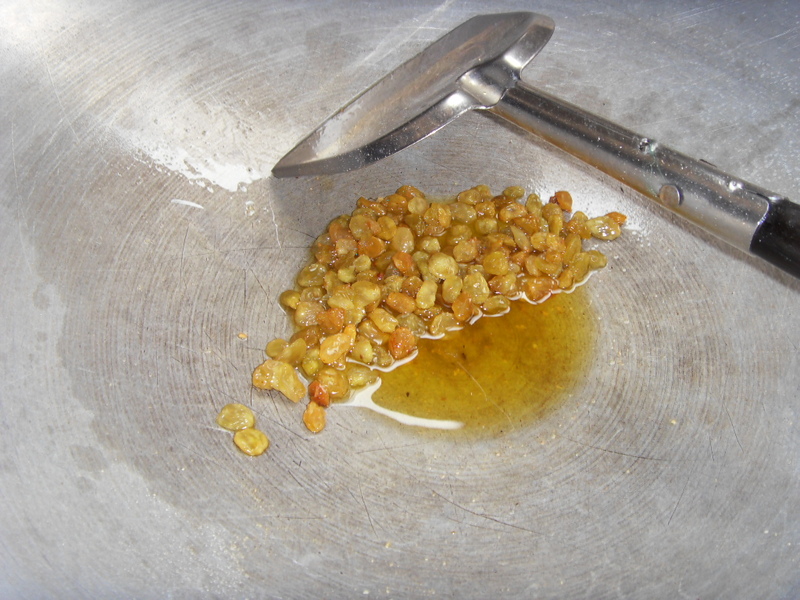 Leave the kokonda for a few minutes and you may drain out some of the juice before serving. 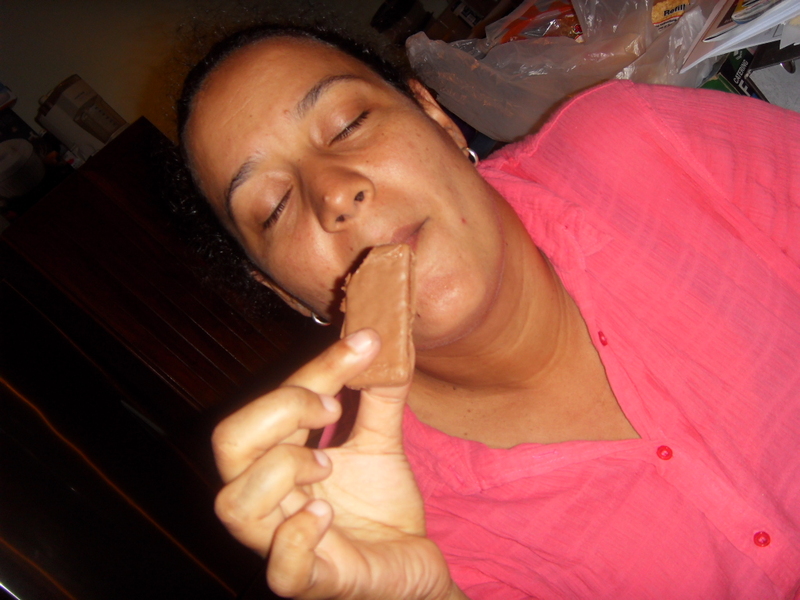 Now after a nice, healthy dish like Kokonda, nothing beats this…..
A good old TIM TAM!!! And don’t ask me how she likes to have her Tim Tam these days, ask Danny Lim, he left a little legacy in Fiji! By the way, Angela has a fair few recipes I need to scab off her, her muesli bars and biscotti..
Miss you Angela and Meretalai…See you next year.